What is another word for inability? 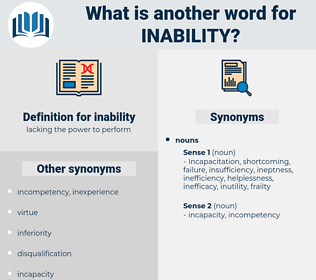 Lacunae, media, inadequacy, Incapacitation, infirmity, lack, unfitness, capacity, unwillingness, weakness, capability, ineffectiveness, disability, refusal, impossible, absence, difficulty, disqualification, shortfall, failing, shortage, shortcoming, deficiency. incompetence, unsuitability, ineptitude, powerlessness, helplessness, unavailability, impossibility. sufficiency, skill, strong point, talent, competence, success, capacity. flair, competency, effectualness, bent, aptitude, adequacy, effectiveness, efficaciousness, suitability, suitableness, efficiency, knack, gift, potency, puissance, sinew, fitness, genius, strength, endowment. Marjorie was never chosen until toward the last, for though everybody loved her, yet her inability to spell was known by all, and she was not a desirable assistant in a match. And part of this inability arose from their curious fear of the past. 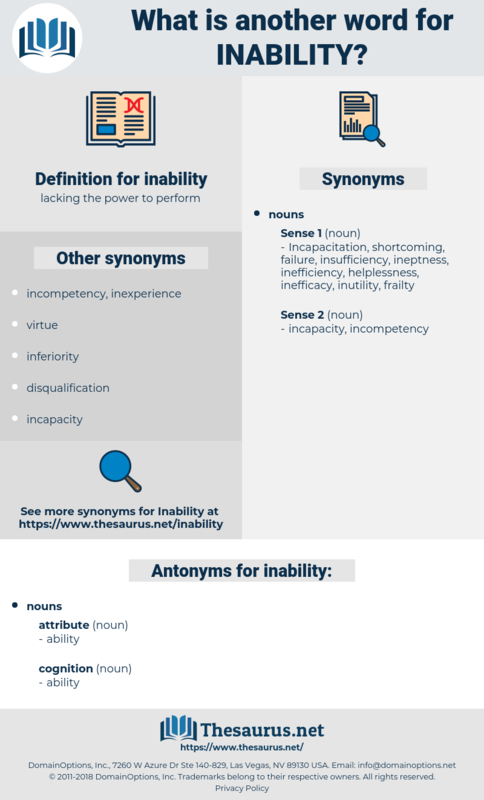 insensitivity, incompetency, insufficiency, insensitiveness, incapableness, incapability, incompetence, unadaptability. analphabetism, unskillfulness, block, stupidity, mental block, incomprehension, inaptitude, incapacity, uncreativeness, illiteracy.